It felt fitting to end the year by sharing my favourite herbal tea. It has a beautiful calming effect on the digestive tract, appropriate given the time of the year and the tendency to over indulge – particularly on Christmas day. Kawakawa (Macropiper excelsum) is a New Zealand native, a relative of the pacific kava kava (Piper methysticum) – they look similar but have very different therapeutic actions (simply put, kawakawa is stimulating whilst kava is sedating). Some years ago, I got to truly ‘meet’ kawakawa whilst on a Shamanic Herbal Apprenticeship. The course taught us to work intuitively with plants. We spent weekends in the bush of the West Coast, Auckland. We learnt to identify and harvest wild plants, prepared nourishing herbal infusions, whipped up natural creams and potions, infused oils with mineral rich seaweeds, made flower essences, engaged in ceremony and ritual, shared, healed, and most importantly, opened up a two-way dialogue with our plant allies. We were encouraged to choose one plant to work intimately with over the span of five months. Kawakawa became my ally. Each week, I sat with the plant (it grew in a small forest near my home) and tuned in to its energy. I was very much used to working with plants from a scientific standpoint – I was familiar with its constituents, its pharmacological actions, uses and dosage. But I had no idea what the spirit of the plant was like. As the weeks went by, it absolutely shattered my expectations. I assumed, being a member of the pepper family, that it would be dynamic, active, passionate, hot and fiery. In contrast, as I invited the spirit of the plant into my being during meditation, I found it soft and fluid, swiftly dissolving old hurts, working directly on the heart. It certainly has that signature – the leaves are a soft heart shape, dotted with holes made from the native Looper caterpillar (this caterpillar is the only insect to afflict the plant – as it contains natural insectidical properties). I could sit for a whole hour at a time, feeling that pulsating, warm energy pour through the crown and swell in the heart chakra. I got the sense that it was wildly untangling my baggage and blockages – in fact, Kawakawa as the Ganesh of plants is a fitting metaphor: remover of obstacles in the heart! Clearing the weeds! Making space for the new! 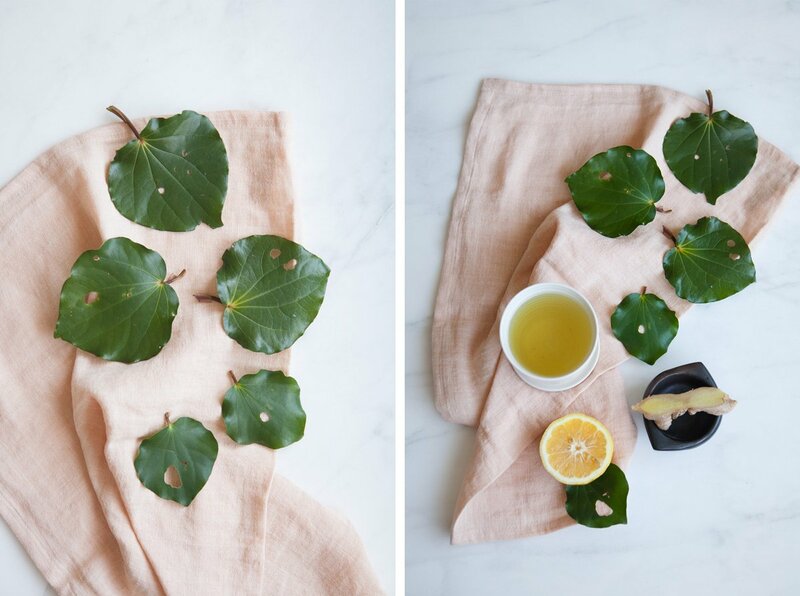 Aside from the incredible clearing and healing that kawakawa gives energetically, it is a well-known traditional remedy for digestive ailments. As a digestive tonic, it helps ease gastric distress and indigestion due to over eating, reduces spasms in the gut, and helps dispel wind. It also has anti-inflammatory and analgesic properties, and contains compounds that are both antimicrobial and antiparasitic. Being a member of the pepper family, it certainly has some circulatory stimulant actions, which help warm a cool constitution and bring some much needed blood flow back to the gut. Whenever I drink it as a tea, I can feel this comforting warmth spread from my stomach throughout my digestive tract. Depending on the strength of the brew, this can last for a good hour or so. 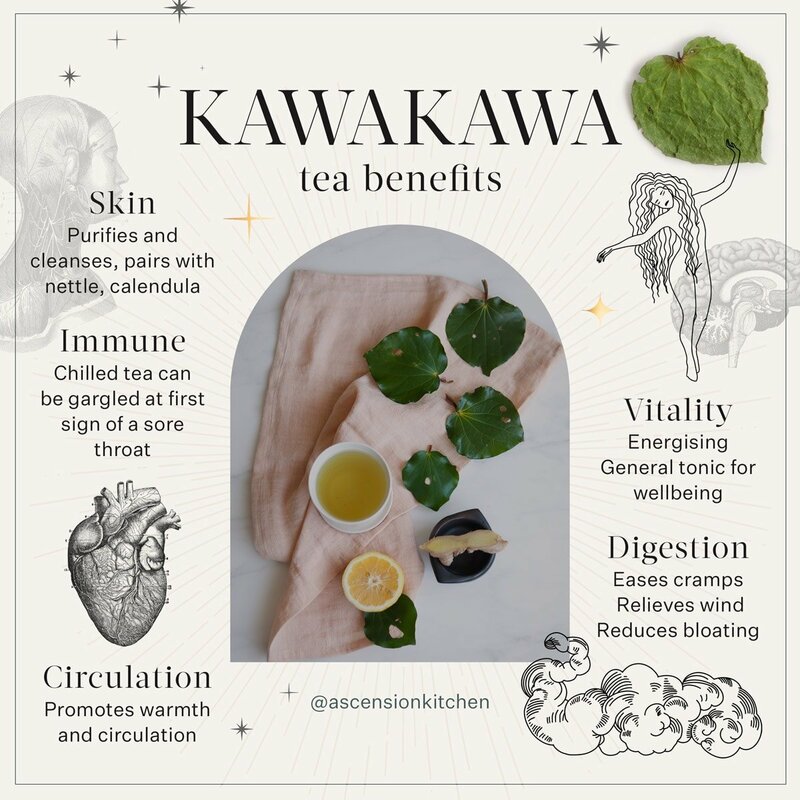 You can buy kawakawa tea from a natural foods store. But I prefer to harvest some myself, since it grows quite prolifically around coastal areas. I was taught to make a small offering to the plant before harvesting, and never take more than you need. The leaves with the most holes in them are said to be the strongest therapeutically. 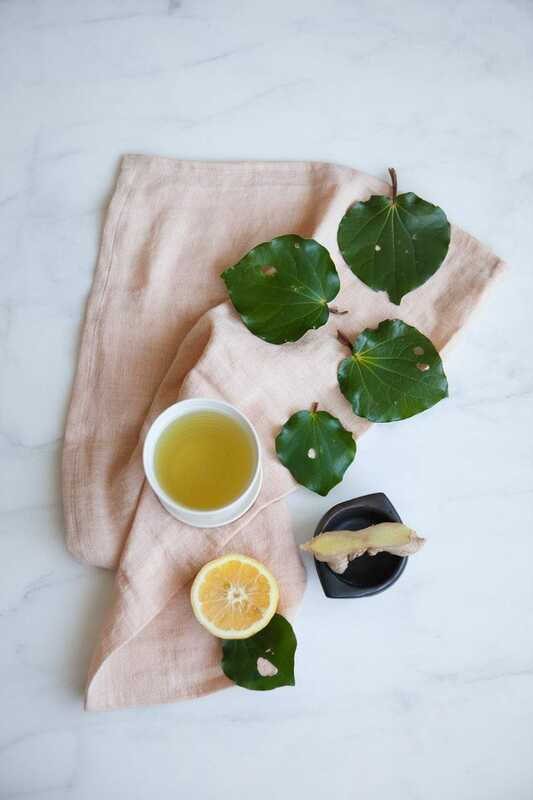 To prepare a herbal infusion, you simply add a good handful of freshly picked leaves to a pot of water, and let simmer for up to fifteen minutes, discarding the leaves before serving. 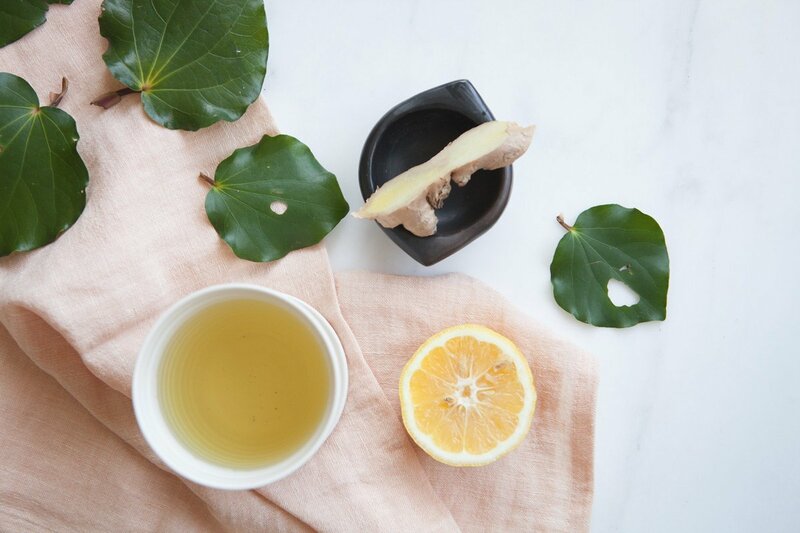 A chunk of ginger root added to the pot whilst it bubbles away lends some extra gut-calming effects, and a squeeze of fresh lemon is optional to flavour. For those who like a slightly sweeter brew, raw honey is a lovely addition. I recently discovered a brand of honey called Beagle’s Bees, from the Hawkes’ Bay, New Zealand. Their honey is ethically harvested as the bees are not fed sugar water during the winter months – this is sadly common practice in the industry as they simply over harvest the honey leaving nothing behind for the bees. I used to use honey liberally in my desserts, but after taking a beekeeping course, and learning the real story behind commercial honey, I feel more comfortable using it medicinally in small amounts, consuming it with the deepest of gratitude. So there you have it – my favourite herbal tea, energetically healing to the heart, and physically calming to the digestive system. If you don’t live in New Zealand, I’m afraid you will have to source a store bought tea, but I encourage you to try it all the same, and tune into your body to note how you feel as you drink it. I have a cup in my hand now actually – the last few days have been spent in foodie heaven and the tummy needs a bit of love!